You probably have heard of Mr. trivago or about the famous slogan “Hotel? trivago” on TV. Anyway, it’s hard to miss. trivago is more than a hotel meta search website. You probably don’t know it but trivago is very important in the world of tourism and offers services to hoteliers in addition to their service to costumer. It’s been six months that I am a graphic designer at trivago. In fact, I’m a communication designer. Today I will speak with you a bit about my job as graphic designer in this big company. 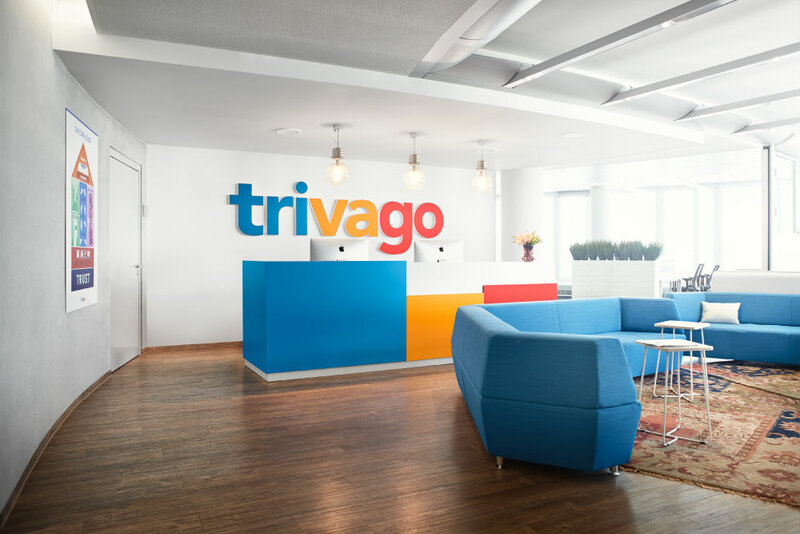 The design department at trivago is quite large and is divided by specialty (product, UX, marketing, …). No, I don’t create commercials on TV (I don’t even own a TV) but I take care of graphic communication. So I am part of a 14 designers-team, all experts in the fields. My field of expertise is print design. Our team is divided into sub-teams; for example, I’m mainly in charge with a colleague of mine for all internal communication (flyers, posters, booklets, merchandising, and so on). Together, we support the human resources department. That’s a lot of work when you know there are over 950 employees in trivago (). I applied at trivago while I was writing my master thesis to get my Masters in editorial design at the Fine Arts faculty of Porto. I was looking for a job in Germany, NRW especially and in English if possible. I admit it was not that easy to be hired. The first step is the conventional step: You have to send your CV, portfolio and cover letter in English. So far, easy. Then I received a case study which has to be done in one week. I had to create a visual of my choice to explain trivago (in my case, I was on holidays in Prague when I received the mail and I did my project in one night, it was a flyer accordion). Apparently, it wasn’t that ugly directly because I received an invitation for a Skype interview with my head of department. If you have never had a Skype interview, well you need to know that it’s really super weird. Without going into details, it was stressful and tricky, I thought I failed. Apparently not, since I had to have another Skype interview (with my future colleague), much more cool and informal. After that, I stressed a good week before getting the email telling me the good news! I asked to start two months later just to have time to finish my thesis and I started my adventure in October 2015. You begin with an introduction week where you learn the basics about trivago, its departments, you meet your future colleagues and a lot of great people from everywhere in the world. I have to say that we are only 2 Belgian in the box and I’m the only one coming from the french-speaking part #foreveralone (). First of all, you should know that trivago has several buildings in various countries. In Düsseldorf, trivago occupies several floors in three different buildings. You spend a lot of time to get from one building to another, especially if you have to work with other departments. You don’t want to walk? No problemo, there are scooters available (but I prefer to bring my own from home. #coolkid). All offices are decorated by themes (my favorite is the dinosaur meeting room! ), It’s pretty! If you forgot to had breakfast at home or you left your lunch at home, don’t worry. You can always make your choice in the assortment of cereals which are offered in the different kitchens. There is also a wide choice of fresh fruit, meals (soups, wraps, sandwiches), snacks (sweet or salty), but also fridges full of drinks. You will find coconut water, hipsters sodas and beers. Yeah, there are beers at work. Oh by the way, everything is free. Sport classes: For free and after the working hours. You can make your choice between yoga, boxing, boot-camp, swimming or pole-dance classes for example. German lessons in the classroom and with different levels: It allows you to learn German even if the company language is English. I have twice one-hour class per week, I have to be present regularly, I have homework to do and even exams. It’s serious deal! Conferences on many topics with internal and external stakeholders. Sometimes these conferences are coupled with workshops or tours / trips. For example, I could visit museums, learn to cook Vietnamese, learned the basics of CSS, .. Many parties/events that bring people together. It can be for the company (like the craziest Christmas party ever) or just with your department or language communities. In my case, I have a design team event 1x per month and a FR-BENELUX team event 1x per month. In addition, there is trivago fridays that allow you to meet with the managing directors of trivago, share beer with your colleagues playing console/kicker/billiard with a DJ. trivago mantra is work hard, play hard. But all these advantages are there for a reason. I spend many hours at work, I have a lot of work and responsibilities. Ok, let’s be clear, I worked briefly agency and it has nothing to do with that kind of stress. Don’t get me wrong, spending hours at work does not bother me because, after all, I still live of my passion and this is a great opportunity, especially as a graphic designer (but that is another story). It’s quite easy to spend hours and hours trivago because everything is designed to answer to all your needs there (there is food, consoles to play, spaces for rest, showers,. ..). Also, you meet so many people that it becomes very easy to stay only with your trivago friends. This is convenient for people who come from far away and/or who don’t know anyone in Germany. It can be hard to separate work life and personal life and this is a trap where you can fall very quickly. I’m lucky to have many friends outside of work but also trivago friends so I confess, I don’t spend so much time at work. In itself, trivago is a truly innovative and special company. I met many of my good friends, I spend extraordinary and crazy moments, I learn a lot about myself professionally and personally and I’m really lucky to have discovered it all. If you want to work at trivago, don’t hesitate to have a look on their last job offers. By the way, this blog post is not sponsored, I just wanted to talk to you about my job and share this experience. I hope that you liked this article, don’t hesitate to leave a comment! I just stumbled upon your blog and the post about working at trivago. First of all, thank you for sharing your experience from your own personal perspective. Your story gives a very nice glimpse into trivago environment. I am planning on applying to trivago myself for a position within project/product management area. Hi Agata! Thank you for your kind comment 🙂 You can contact me by email through the contact page with your questions, I will answer you asap, i think it’s better than comments 🙂 See you soon! I’ve just been reading your blog and wondered if you could help me at all. There are a couple of positions within Trivago that I am interested in applying for. As there are a lot of applicants per role I want to get it right. Do you have an example of the cover letter/motivational letter you sent as I think it would be really useful so see some examples to check I am on the right track. Thank you for sharing this experience. And you personal website is quite outstanding. I guess you had an internship there… right? May I ask did trivago help with accommodation during your stay?